The antennas at WB8YQJ are at present a modest Hexbeam for 10m/15m/20m at 35 feet, and a center fed zep antenna mounted at the apex which is 65 feet long and used for 40m contacts. 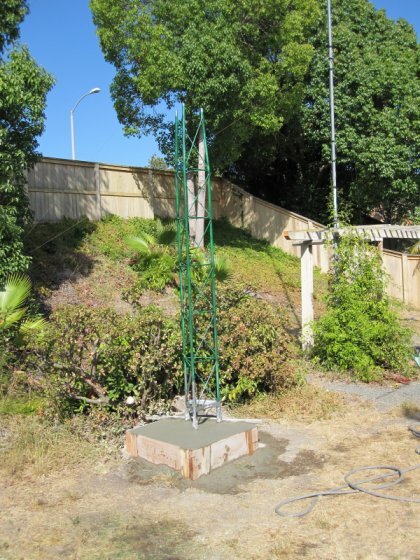 At the back of the lot is a GAP Eagle antenna which we use as a 10m ground wave antenna and also for the 12m and 17m WARC bands. Even the hexbeam pointed in the wrong direction is heard better than the GAP antenna, however the GAP antenna is several decibels better than a monoband dipole mounted at 30 feet at the same location. 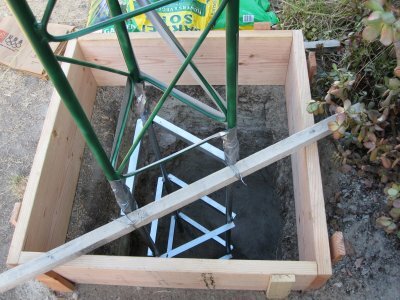 The antenna project started in August of 2010 with the digging of the hole for the tower. The push up style mast it replaced is shown off to the right attached to the wood patio cover. I have had a GAP Eagle installed at this location since 1993. Mine is painted green, and ground mounted near trees for a minimal visual impact. The antenna performs equal to a dipole at 30 feet in height on 20m-10m and is super tough and durable. I cannot keep any wire up for one year, the wind always blows them down, the GAP just works for years and years without a care or worry. The RF exits the antenna at a height where it has a chance to escape large ground loss as compared to a true vertical and there are no traps so 100 watts less your coaxial loss is what goes out. This antenna is 40m "compatible", but is too short to use as anything other than an emergency antenna on 40m, any longer wire will beat it. There are two ways I see to make this antenna fail for SWR, a botched application of the PL259 - that happens more often than you would think, and if you dont wrap electrical tape around the top of the steel pipe which is driven into the ground, it is possible that the rigid ground rods assembly will short to the mast upon assembly. The antenna will not tune this way. The antenna is a dipole mounted on one end, not a vertical, and thats why the GAP antenna does not have the aggravating problems common to smaller than physical half wave antennas. But neither side of the antenna can be grounded, the entire antenna must be insulated from the ground pipe. This antenna design has a major benefit in that it collects the signal from more polarity angles than a dipole. As a test, I mounted crossed dipoles at 20 feet, one vertical and one horizontal and then put them on an A/B switch. I see from equal to S9 differences and it always changes within moments from one antenna to the next being the better. all working to accept the signal from many angles. It sounds problematic, but it is consistent and can be dialed in with time, trial and error. Some other antennas I have used (the Butternut Butterfly comes to mind) are loaded with reactance and are feedline length+orientation sensitive, they will truly drive you nuts. The GAP has a wide sweet spot and it can be found fairly easily. The AT1500cv is the updated version of the popular HF1500 from Palstar. It has a new look and a new ceramic based roller inductor for high power operation. I run 100 watts only, but appreciate the substantial antenna switch and quality construction. Unlike some other brands, this unit has NOT been scrutinized from top to bottom for potential manufacturing cost savings. Nor is it hastily assembled. This is a piece of ham gear that you'll want to keep for life, at a price that is only slightly above the cost cutter units. Dentron used to make ham gear this way, and guys still love that gear today. If you are considering a tuner, you owe it to yourself to take a look at the PalStar website! I bought a new Whirlpool "Duet" front loading washing machine and it put S7 to S9 noise across the 20 meter band at approximately 10 khz intervals. The S9 hash noise is accompanied by a strong BUZZZ at many points on the dial. 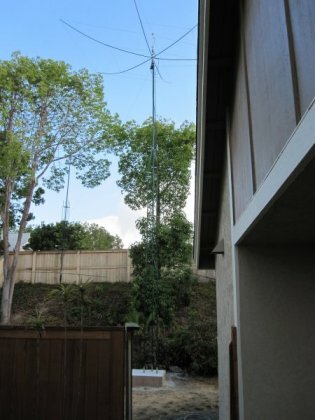 Rig is an OMNI VI+, antenna is a GAP Eagle, and the noise antenna is a fan dipole fed with twin lead and installed in the attic. The noise is cancelled out completely. All I can hear are traces at a few points on the dial if I listen and tune the transceiver very carefully. You judge for yourself what that would be worth to you. It also worked to phase out RFI from a 27" SONY TV in the shack, that application didn't even require the external noise antenna. Remember though that the device only tunes to a single noise source so it's the washer or the TV but not both. The MFJ box has the usual marginal fit and finish. I hate repainting a -new- item! But the PC board inside is a quality (SMT) unit and the switches and pots are good too. I'm amazed that some of the early reviews have watered down this product's rating, but that's the nature of these reviews for many products it seems. If you take the time to setup this box properly, it will work wonders for you.